Storing items like markers or crayons or colored pencils (or even knives or knitting needles or screwdrivers) in their original package can have its advantages. You know when an item in the set goes missing, it makes the collection easier to transport, and you don’t have to worry about keeping them clean. However it can also be a hassle to store items this way as well. You have to pull out the package each time you want to use one item, it can be time consuming if you are in a rush, and then there is the matter of storing all those packages. I like to store groups of items in containers that allow me to ‘grab and go’. Whether that means I grab one item such as a screw driver and get a picture hung, or grab an entire jar of markers and take it to another room, it’s easier than messing around with a package. In my creative studio, I have a desk where I do a lot of drawing, penmanship practice, lettering, and other things that require pens, markers, and pencils. 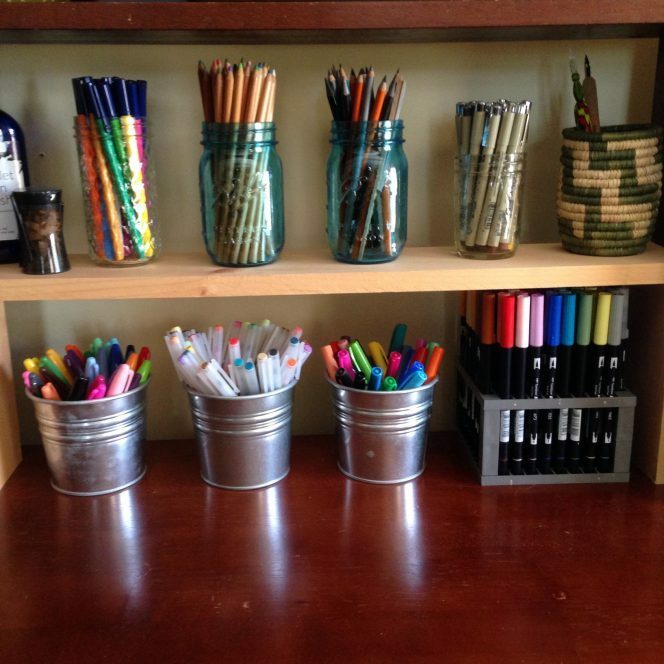 Because I also sew at this desk, I set up a removable shelf, and on it I store my most used pens, markers, and drawing pencils (which actually isn’t true – I have two more sets out at my computer desk). I use mason jars and small galvanized pails the most, because they are the perfect size. The handmade basket that holds my dip pens is a fair-trade item that I picked up locally and I wanted it to serve a special purpose. As you saw the other day, I keep my knitting needles in a pretty pitcher, and if I were to go through my house I could draft a fairly good sized list of items that aren’t being stored in their original packaging. It also makes for creative and eye catching decor.